Sometimes, it seems like traditional terrorism and security just aren’t exciting enough. So now, hot off the presses, we bring you a story of cyber-espionage that involves a bunch of anonymous, rather amateurish Iranians trying to hack America by using a neocon who is a favorite of Fox News – and a possible presidential candidate. According to The New York Times, the story starts in 2011, when cyberterrorism was just starting to cause trouble for defense establishments around the world. It began just months after the Stuxnet virus destroyed more than 1,000 Iranian centrifuges at Natanz. Among the 2,000 cybertargets was Michael Bolton, a former UN ambassador who nowadays is a vocal neoconservative opponent of the Obama administration’s foreign policy. The method was simple: the identities of hundreds of American computer users, Bolton among them, were hacked by a group of unidentified Iranians. Using those identities, the hackers hoped to chat online with leading Washington officials. Bolton, who said he was “honored” by the hacking, claimed a fake LinkedIn account in his name was used with the aim of finding out just how much America knew about Iran’s nuclear program. According to The Daily Beast, which was one of the first to publish the story, the hackers took months to build up trust with their targets, some of them human rights activists. Unfortunately, they used subpar English to do it – then followed up with amateurishly transparent attempts to hack professional Gmail accounts. 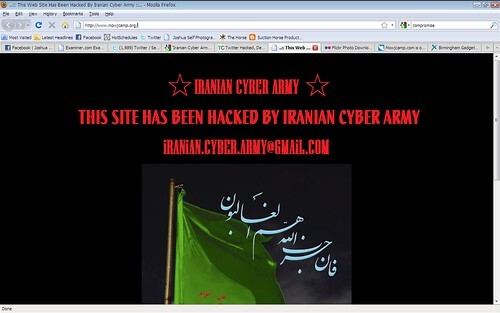 The West has been going on about the Iranian nuclear threat for years, but the Iranian cyberterrorism threat? That’s new! At least the hackers have left so many traces that this threat, unlike the first one, is undisputed.